Intrigued by the large sign at the corner of the Midtown Borders in Atlanta, I decided to pop in with the kids to scoop up some bargains from the chain’s going-out-of-business sale. 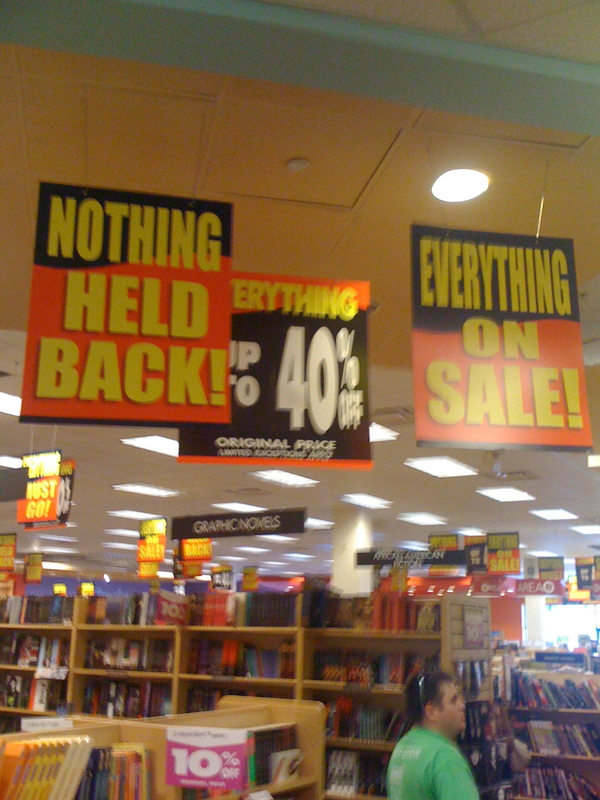 After all, the sign said (up to) 40% off regular prices. We were not the only ones with this plan. The shopping center was mobbed. After five laps around the parking lot, we finally procured a spot. We then dodged cars that were driving too fast for a parking lot (the prospect of a going-out-of-business sale induces people to speed, it seems) to make it into the store — where I saw the longest line I have ever witnessed in any bookstore — even at Barnes and Noble on Christmas Eve. After a ten minute wait, we had to leave to store to accommodate my daughter’s bathroom request. Borders had closed its bathrooms to customers (once you’re going out of business, customer comforts are no longer priorities, I suppose), so we headed to Whole Foods. Then we returned to the still massive line, waited — and waited. When we finally reached the front, we found that the books we planned to buy were only 10% off — not 40%, as the sign said. Only magazines are 40% off, the cashier told the irate customer ahead of us. Of course, by the time we reached the register, we would have gladly paid double for the books, as long as we could leave the shop. I do feel for Borders, and for the thousands of people who will lose their jobs when the store liquidates. But I wish I had earned a steeper discount after that chaotic shopping spree.